Funny. I live in one of the most northern cities in the world. As I write this, the landscape is bleached of colour, the snow is piled higher than in recent memory, and in spite of the arrival of spring a few days ago, the temperature refuses to inch above zero. 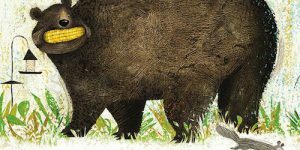 And yet, one of the finest African picture books, from one of the finest African storytellers originates from this winter city. 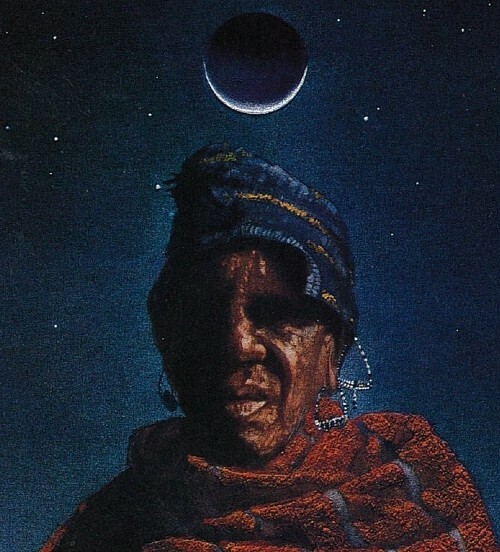 Flipping through the pages of The Orphan Boy, a book that has been in my possession for almost twenty years, I am once again beguiled by the poetry of Tololwa Mollel’s words as he recounts the Maasai legend of the planet Venus. It is enough to warm my blood, but in unison with Paul Morin’s wondrous paintings of Africa, I feel spirited out of my down-filled parka to the arid farmlands of Tanzania, gazing up at the star-filled night in the company of an old man who is destined to meet a very unusual boy. These are the first words spoken to the old farmer as he searches the sky for a missing star but is instead, greeted by a young boy. Childless and alone, the man offers the boy his home. In the morning, a bowl of hot tea awaits the man, ‘made with lots of milk, just the way he liked it.’ All of the farmer’s chores have been done, and Kileken has taken the cattle to pasture. When he is questioned, the boy responds, “The day begins at dawn. I get my energy from the first light of day.” Most boys get their energy from pop tarts and Xbox. 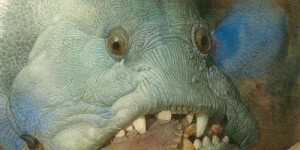 This is a very unusual boy indeed. 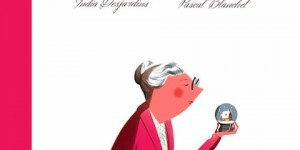 The old man is puzzled, and as the days pass, more questions arise, but they are not voiced. The man is grateful for the boy’s companionship, and under Kileken’s care, the farm thrives. 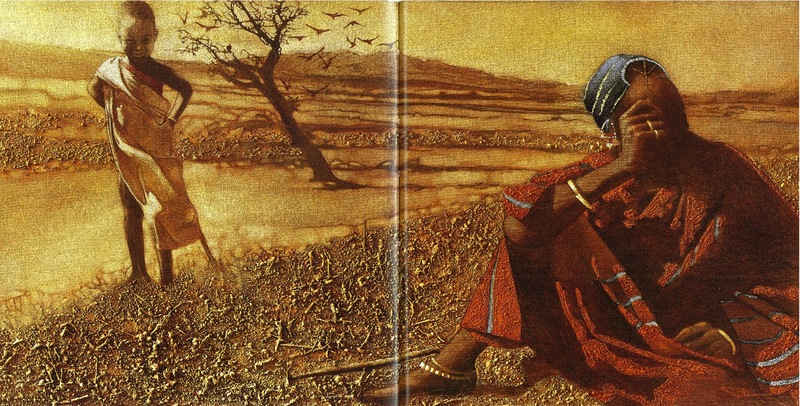 The life-giving rains end, and the land becomes parched as the “sun hooked its claws into the soil”. 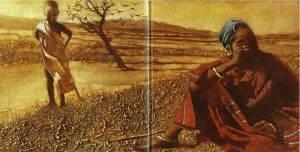 Without exception, every single illustration in The Orphan Boy is heartbreakingly beautiful, but Morin’s painterly skills are given full expression in the scene of Kileken standing behind the crouched and worried old man, feet buried in the brittle, clod-ridden dirt, their bodies encased in the sepia and yellow ochre landscape. There is a lovely sensuousness in the heavily textured paint, which makes the impasto illustrations of soil and flesh come alive. Drought has never looked so lovely. In spite of this worsening drought, Kileken returns each night from the pasture with old man’s cows, whose ‘bellies burst with good grazing.’ The man’s curiosity grows, but the boy refuses to divulge his secret. “I must not tell you and you must never seek to know. For the day you discover my secret will be the end of your good fortune.” ‘nuf said, but of course, that’s not how it works in folktales. 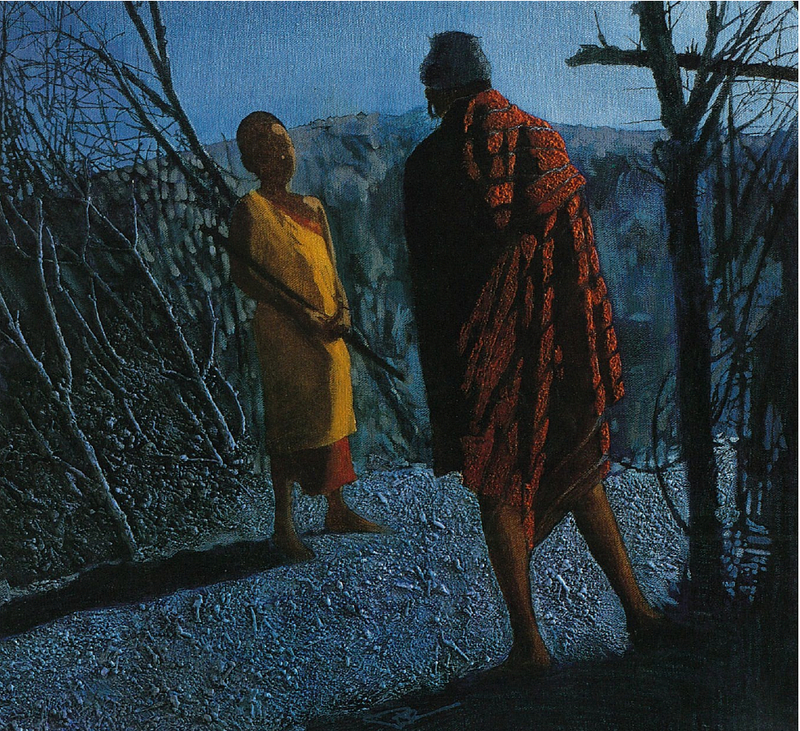 Without folly, there is no story, and folly is visited upon the man in the form of a whispering shadow, who convinces him to follow Kileken on his morning rounds. Far from the compound, Kileken climbs a rock and raises his arms toward the rising sun. As a powerful glow spreads down and through the boy, the baked earth is transformed into a lush green wood, with gushing streams and some mightily grateful cows. 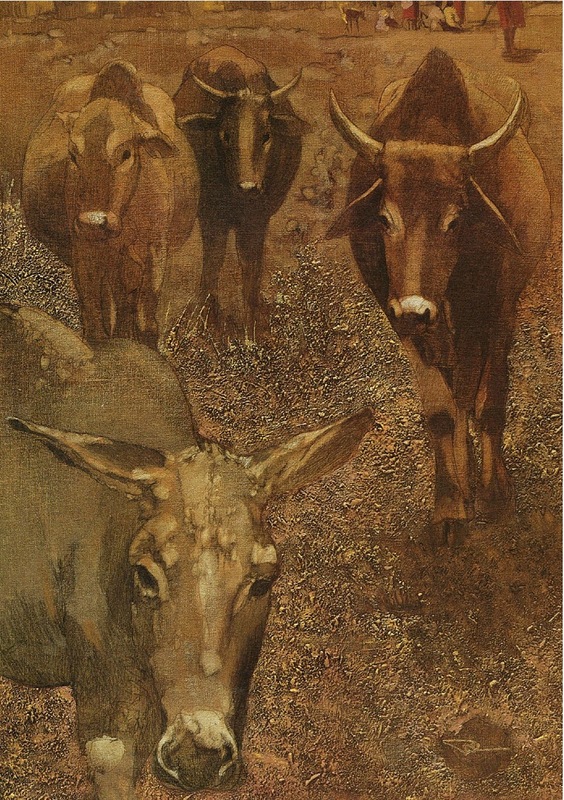 But when Kileken sees the old herdsman, he is filled with sorrow; the trust has been broken. The boy explodes into a blinding star (as boys will do), rising quickly in the air. 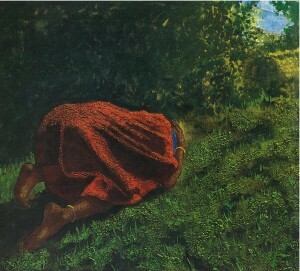 The land returns to scrub, and the old man never sees the boy again. In the sky, a new star appears. The Maasai call the star Kileken, the orphan boy, “who is up at dawn to herd out the cattle after morning chores, and who returns to the compound at nightfall for the evening milking.” We know it as Venus, the second planet from the sun. The cows call it the Brightthingthattookawaythegushingstreamsandthegrass. Cows lack a sense of wonder. The Orphan Boy is one of those books you come across every so often that is perfect. Perfect in every word, perfect in its realization on to the page. Beautiful words demand beautiful art, and in the hands of Paul Morin, The Orphan Boy gets a visual champion. The African landscapes are richly hued jewels in blues and ochres, conveying not only the beauty of the land, but even the contrasting temperatures of cool nights and the arid heat of drought-ridden days. How does he do that? One thing that bridges each of Morin’s paintings in this book, and others, is his unique method of incorporating textural elements directly into the paint. This tactile element is present in the background landscapes, but it can also be seen in the rough weave of the old man’s wrap, where the red-soaked fibres catch moonlight as if they are three dimensional. The faces of the the boy and the old man are so wonderfully specific, they must be portraits, perhaps from Mr Mollel’s own family. The cows are nice too. 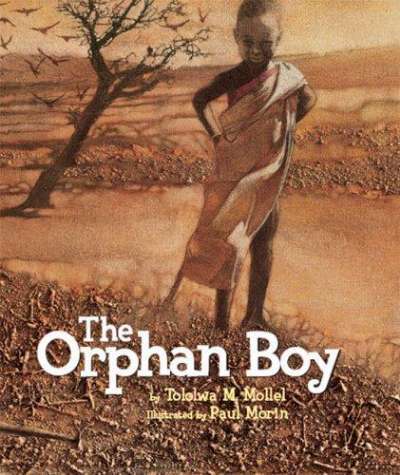 The Orphan Boy is a bit of African (and world) folklore that somehow manages to be deeply personal, which is storytelling at its best. 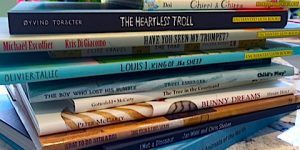 In a recent Edmonton Journal article (and from his website), Mr Mollel called the storytelling tradition into which he was born, feasting on words. Tololwa Mollel was raised in Arusha, Tanzania and received his undergraduate degree from the University of Dar-es-Salaam Tanzania, and his master’s degree from the University of Alberta, in Edmonton. While employed at a local independent bookstore, I had the pleasure of meeting Mr Mollel and his lovely (and hilarious) wife Uju, who was briefly my fellow book slogger in the children’s department. 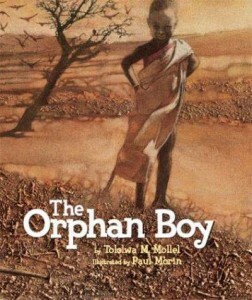 During this tenure, at least three books, in addition to The Orphan Boy, were published, an indication that Tolowa Mollel, author, actor, and playwright, is a man with many stories to tell, which is our very good fortune. Paul Morin was born in Calgary, Alberta, and grew up near Montreal, Quebec. 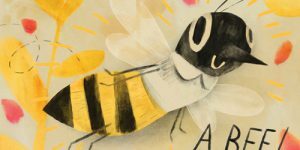 His studies include design at Grant MacEwan College in Edmonton, the Sheridan College illustration program in Ontario, and the Ontario College of Art. Since 1985 he has produced many beautiful books, art installations, music CDs, and videos. A life-long interest in traditional cultures has taken him to Africa, Australia, China and throughout North, Central and South America. *Edmonton Journal, March 19th, 2011. 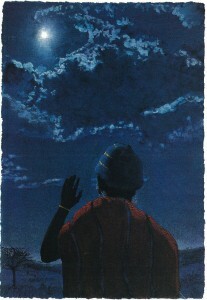 2 Comments for "Under African Skies"
Have a print from Tololwa M.Mollel of the Under the african Sky, From The Orphan Boy book. # 5 of 100. Looking for any info, history, value etc. Any info would be greatly appreciated. Lucky you! But do you mean a print from Orphan Boy? I just titled this post Under African Skies. 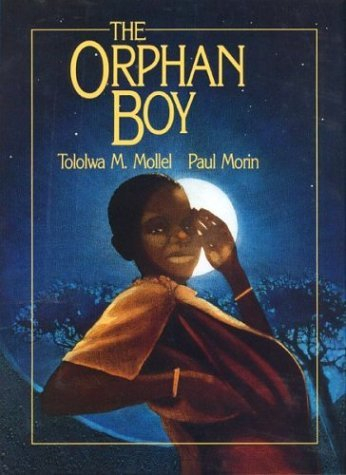 The illustrator for Orphan Boy is Paul Morin. 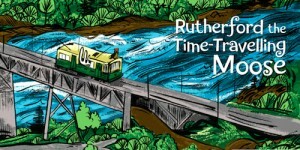 I would recommend contacting the illustrator directly at http://www.paulmorinstudios.com/ Cheers.